Forty-two members of the legendary First Special Service Force, better known as the Devil’s Brigade, attended a ceremony in Washington DC on Feb. 3, 2015 to receive the nation’s highest civilian honor, the Congressional Gold Medal. 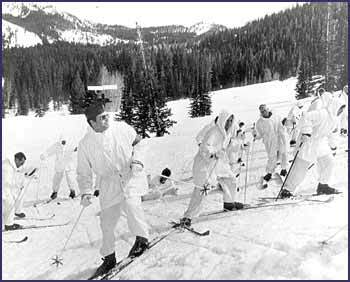 The First Special Service Force was a joint Canadian-American group of commandoes trained to drop behind enemy lines in occupied Norway during World War II. Fourteen of the attendees at the ceremony were Canadians. When the mission to Norway was called off, the Forcemen were sent to assault the Japanese held island of Kiska in the Aleutians, then were sent to the mountains of Italy. In Italy they climbed the German held mountains of Monte La Difensa and Mount Radicosa. 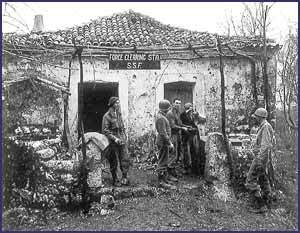 A Devil’s Brigade outpost at Anzio. During the landing at Anzio, the Forcemen mounted large-scale night raids into German territory, their faces blackened by shoe-polish. German soldiers, terrified by their commando tactics and night raids, dubbed them the “Black Devils.” They eventually led the Allied advance into Rome. The First Special Service Force participated in the invasion of Southern France, but was disbanded December 5, 1944, with the Canadians returning to their own army. The surviving members of the Devil’s Brigade who were unable to attend the ceremony in Washington will receive their Congressional Gold Medals at a ceremony in Helena during the summer of 2015. Stay tuned for more information. Learn more about the Devil’s Brigade here.